For two years now, once a week from the Lindström headquarters in Zagreb, a truck loaded with enough clean sets of workwear for all five working days in the week has set off from Zagreb, deep in the inland of Croatia, on a trip of 419 km to the fish processing works Sardina on the Adriatic island of Brač. This, the biggest of the islands in the central Adriatic, its Vidova gora being the highest peak on any of the islands, is best known for its white limestone, from which many of the most celebrated buildings in the world are constructed, most prominent of all being the White House in Washington. Next to the natural beauty of the Mediterranean clime, including the crystal clear blue sea and the gorgeous sandy beaches, with Zlatni Rat in Bol being one of the world’s most photographed strands, Sardina has for a full 108 years been the chief economic generator of the whole island, employing in its plants the majority of the local population. It is also, accordingly, responsible for the island’s sustainable development. 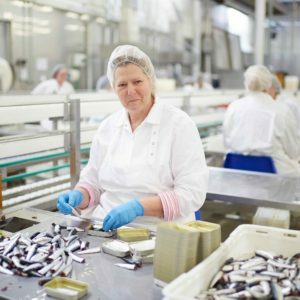 The approach to this was particularly advanced in 2013 when a new factory occupying 15,750 square metres and using the most modern technology for fish processing was opened up in Postira. Evincing the firm’s simultaneous concern for the environment and natural resources, the plant adheres meticulously to the highest ecological standards and quality control norms, as proved by the ISO 9001:2000, HACCP and Kosher certificates it possesses. When the new factory was being launched, a strategic partner was sought to meet the high standards in our industry. Take it into consideration that Sardina has a greatly diversified production line. It covers a whole series of products, canned fish, fish paste, marinated products, salted products, fresh fish, fresh aquaculture products, fish meal and fish oil. In order to sustain the quality, we developed the most contemporary laboratory with equipment for the surveillance of all the critical points of production in line with the HACCP and ISO quality systems. “As for workwear, our choice was naturally Lindström, because we realised it was the highest quality clothing on the market. We were additionally pleasantly surprised by the innovative clothing laundry and maintenance service and distribution. Just like Lindström, we are very concerned with energy efficiency. For freezing fish, for example, we use carbon dioxide instead of the usual Freon, which has a bad effect on the ozone layer, and the toxic ammoniac; in addition it allows a saving of 15% on electricity. Allowing a defrosting time of only 15 minutes, additional energy savings are achieved,” said Jadranko Nezak, member of the Sardina board with responsibility for production, explaining to us the way of thinking of the management, from the viewpoint of someone with 20 and more years of work in the food processing industry. Life on the island differs in many ways from the lifestyle on the mainland. There’s a relaxed kind of atmosphere among the labour force while they are adroitly cleaning the freshly caught sardine by hand. While the fish are being cleaned, the workwear often gets spattered, a reason why the workers wear Lindström aprons on top. “You work with water while you’re gutting the fish, and the cleaning itself causes deep stains on the clothing. Lindström suits really are the most suitable for these kinds of conditions of work and the workers were delighted when we went over to them. It was quite a relief to have pockets inside, without buttons but strong press-studs. To be able to have the right sized extremely clean clothing, fitting each individual, and getting lockers with your own compartment delighted my fellow workers,” said Jelena Vlahovic, quality system manager. The clear distinction between production line workers and those in other departments is visually perceptible at once thanks to Lindström, that is, to the colours of the protective clothing. While white workwear is worn in the cleaning and preserving processes, the staff in maintenance and transport have blue suits. “I best got to know the concept of functionality when I started wearing workwear from Lindström. Then it became clear to me why the Finns are associated with the story of design based on functionality. 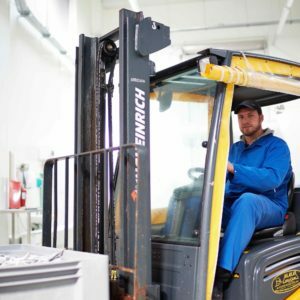 I’m a tradesman in machine maintenance, and my clothing mustn’t impede my movement but set it free so that there is no chance of my damaging either the machines, or myself, or perhaps some fellow worker, with the tools I use”, commented Ivan Glavinic, whom we caught about his activities. The Lindström lockers are filled with white and blue spotlessly clean clothing that is there to meet the Sardina labour force at the beginning of the following week. The truck sets off for the ferry to get to Split, biggest city on the Adriatic coast, on the waterfront of which Diocletian’s Palace, built out of Brac stone, gleams proudly white. From the sea, the Lindström truck heads back to its distribution centre in Zagreb, with a load of workwear that is once again going to be thoroughly washed and repaired, where necessary, and ironed for the next Sardina consignment in a week’s time.